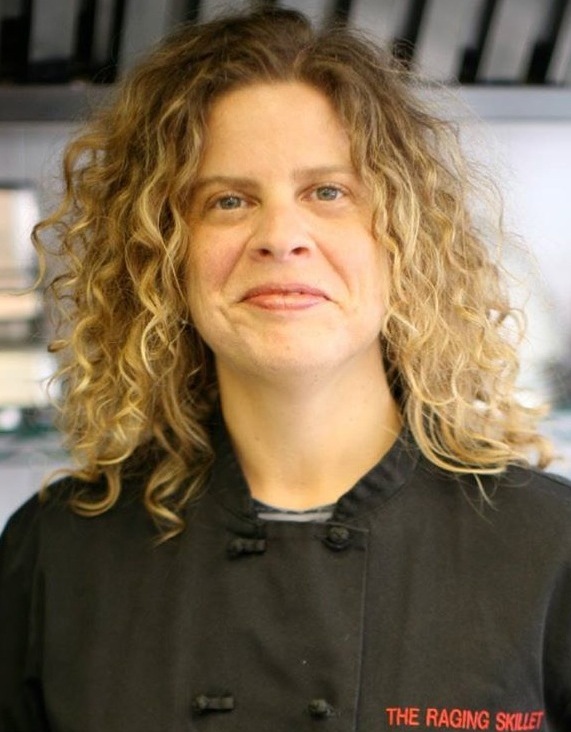 In this exclusive audio interview Emmy Winner Charlotte Robinson host of OUTTAKE VOICES™ talks with Chef Rossi about her new must-read memoir “The Raging Skillet”. Chef Rossi’s story is a fabulous journey of cooking her way through some of life’s biggest challenges in New York City’s most unlikely kitchens. Talking her way into any cooking job she could get, Rossi is a self-taught and self-made entrepreneur who ended up owning one of the most sought-after catering companies in the city. Zagat dubbed her as “the wildest thing this side of the Mason-Dixon Line”. The book features anecdotes from a life of food spanning decades in NYC plus easy to follow recipes ranging from pizza bagels to tuna tartare completing each chapter. We talked to Chef Rossi about the inspiration for her new memoir and her spin on our LGBT issues. Chef Rossi is the catering director, owner and executive chef of The Raging Skillet catering for the past twenty-three years. She has earned a reputation as the go-to company for out-of-the-box catering and weddings. The Raging Skillet has been voted one of New York's Top Five Wedding Caterers by The Knot from 2009 through 2015. The release date for her new Feminist Press memoir “The Raging Skillet” is scheduled for November 10th then kicking off the book tour at Henriettas in NYC on Nov 11th, followed by November 12th at WORD Bookstore in Jersey City, NJ at 7:30P, then November 17th at Powerhouse Arena in Brooklyn, NY at 7P, next November 19th at Trident Bookstore & Café in Boston, MA at 7P, followed by November 22nd at Preservation Hall in Wellfleet, MA at 3P and December 3rd at The Green Building in Brooklyn, NY at 6P for the Feminist Press Challahday Party. Chef Rossi is also currently touring with the Jewish Book Council. What a fun interview and what a fun read...can't wait for her book signing in Boston.